The vaquita marina (literally little sea cow) is a rare species of cetacean endemic of the Gulf of California, north-west of Mexico, that is on the verge of extinction as a result of an explosive cocktail including illegal fishing, the most powerful Mexican drug cartel and a gloomy speculation generated thousands of kilometres away, specifically in China. The last report from the International Vaquita Recovery Team, composed of specialist in this species, reckoned its total population nowadays in only 57 specimens in the Sea of Cortés, baptised by the French researcher Jacques Cousteau as the “aquarium of the world”. That’s why Greenpeace and other environmental organizations have launched a campaign to demand Mexican government to bring to a halt the illegal fishing in a vast marine reserve declared to save this species of porpoise, a relative of the dolphin. 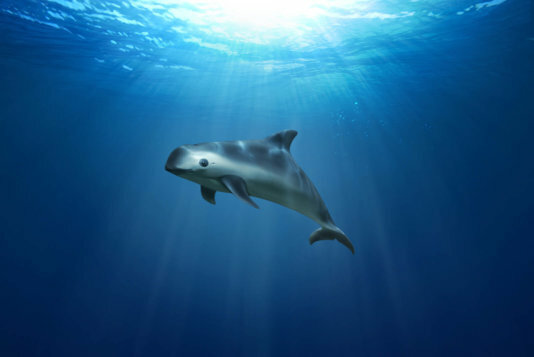 The vaquita, which differs from the dolphin mainly in being smaller (only reach 1,35-1,50 metres) and in its flatter snout, is what biologist called a “remain of the Pleistocene”: a species that was more common before the ice age, but after glaciation it remained trapped in the Gulf of California. Because of that, according to the biologist Miguel Rivas, Greenpeace Oceans Campaign coordinator in Mexico, the vaquita always had a reduced population. “That makes it susceptible to environment changes, if you add to this overfishing and pollution problems, that makes it much more vulnerable,” he says. However, “we have noticed that 70% of vaquitas’ deaths are due to illegal fishing nets”, he points out. But vaquitas are not the target of the illegal fishing in the Sea of Cortés area where they live. It is only a collateral victim of the poaching of a fish, also endemic and also threatened with extinction: the totoaba macdonaldi. The totoabas are huge fish that can get more than two metres long and 100 kg. Their over-exploitation in the 70s put them at risk of extinction, so their fish is forbidden since 1975. Nonetheless, “on 2013 the totoaba illegal fish began in a massive way” because of the demand of its swim bladder in China, Silvia Díaz, responsible of Greenpeace Mexico Oceans program, remarks. In that country, “the bladders are widely consumed in soup. Chinese people used to eat the bladders of another kind of the totoaba as a luxury food in the belief that they have aphrodisiac and curative properties. But they get it extinguished in 2006, so they turned their attention to the macdonaldi”. The worst came when they realised that this fish was rapidly at risk of extinction, and then they are not eating anymore, but they keep it as a speculative item. “Now the macdonaldi is near to extinction, so the less that are left, the higher their price. They pack it in a very fancy box and is used as a gift among important people: politics, businessmen…”, Díaz asses. 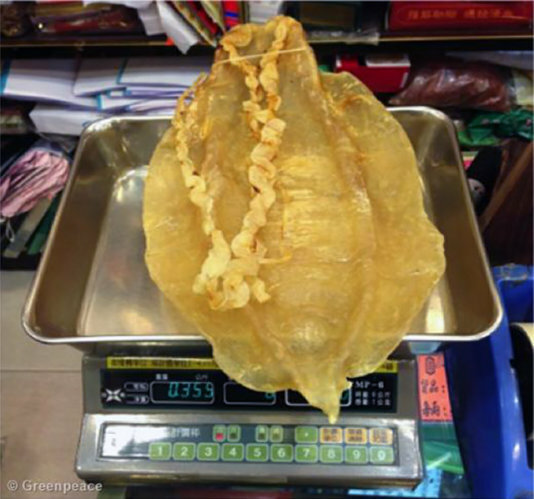 Greenpeace research found that a totoaba bladder, whose weight can go from 700 gr to 1.5 kg, can be sold in Hong-Kong for up to 600,000 dollars. The bigger, the better. This became a lucrative business for the illegal fishers from the Gulf of California, who can earn between 5,000 and 9,000 dollars for a bladder, according to the NGO. The totoaba macdonaldi lives in the same area than the vaquita and their sizes are similar, so frequently the porpoises get trapped in the nets poachers lay and die because they cannot rise to the surface to breath. In 2005 the Mexican government established a 1,200 square kilometres marine reserve where any kind of fishing was forbidden. But a population of 600-700 specimens some years ago get reduced to 97 in 2014, as estimated by the International Vaquita Recovery Team. So, due to the international community and environmental groups pressure, last April Mexico enlarge this area to 13,000 square kilometres for a two years period. But this neither has worked: this year the estimated number of vaquitas left has plunged to 57. 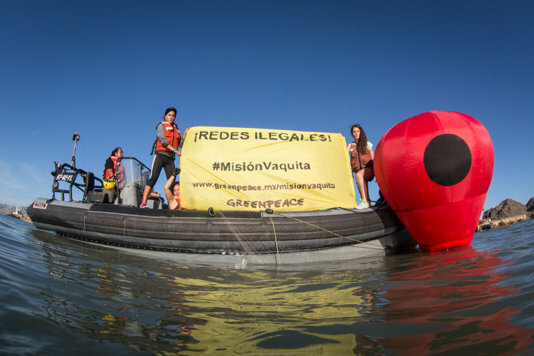 On July Greenpeace sent the ship Esperanza to the Sea of Cortés and found out that in the vaquita reserve the Mexican environment attorney had only two officers to guard an area of sea as vast as the country of Montenegro. In their stay in the zone, they found also several forbidden fishing nets. To enforce the close fishing season in the conservation area, the Mexican government is paying compensation to the local legal fishers from the two villages affected: Santa Clara and San Felipe. The two of them gathered about 800 pangas (the fishing boats used in this zone). Legal fishers agreed to the two years suspension of activities, as they fear that the United States set an embargo to Mexican fish because of the vaquita issue. Nevertheless, they assure that it’s not them who are causing its extinction, but the poachers. “We use nets for shrimps, for little fish, with a very thin thread. A vaquita, as little as it can be, can break these nets”, Ramon Franco, president of San Felipe’s fishers federation, assures. Besides, he adds, “the vaquita detect noises from a great distance and it immediately hides away as it is a very unfriendly animal. When we go fishing, we are hundreds of pangas and make an infernal noise, so they don’t get close to us”. On the other hand, he says, poachers in search of totoabas lay their gill nets and they left, returning the next day to pick them up. Franco claims that, in spite of the several months’ hard work to convince all legal fishers to suspend their activities for two years and look, in cooperation with the authorities, for an alternative fishing gear with traps (harmless for threatened species), the government hasn’t made its work to fight the poaching. “There hasn’t been the required surveillance. We have stepped aside so the government could make its work, but there’s still illegal totoaba fishing”, he criticizes. Furthermore, this seaside area is in a region under control of the Sinaloa Cartel, the most powerful drug trafficking organization in Mexico. They couldn’t miss the opportunity like this: a business of thousands of dollars with a minimal risk, because when somebody is caught poaching totobas, he is freed the next day under bail. According to Silvia Díaz, they now from the natives and some press news that the drug traffickers are in the illegal trade of this species. But México is not the only responsible in the totoaba illegal traffic that is leading to this species and vaquita’s extinction. Greenpeace made an investigation and travel from Mexico to Hong-Kong, calling at the United States, with a corvina’s bladder (very similar to the totoaba’s). They showed it openly to the three countries customs officers but had no problem to get to China with it. Miguel Rivas remarks that to recuperate an ideal vaquita’s population, the conservation area should stay without fishing for around 30 years, something that “isn’t socially or economically feasible”. However, he is optimistic about the survival chances of this species. “It’s necessary to find other options”, he states, “to develop another fishing gears less invasive or less deadly to the vaquitas”. The vaquita is what biologist call a “remain of the Pleistocene”. Message of Greenpeace campaing to save the vaquita saying: "There are only 57 vaquitas left. Act now!" 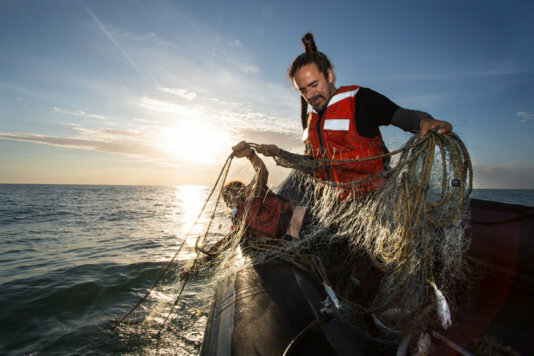 Ruben Albarrán, a Greenpeace activist from the Meixcan group Café Tacuba looks for illegal fishing nets in the Sea of Cortés. Totoaba bladders in the packet as they are sold at the black market in Hong Kong.